Rock Ledge Primary Center, WI. I came across Splash Math some time back. I liked what I saw, both in terms of the thorough common core based curriculum, and also the interactive game-like design and interface. 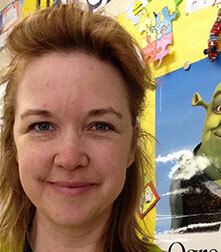 It looked very promising and so I signed up for a classroom account. Right after that I read about the SpringBoard contest. I therefore decided to introduce Splash Math to my students and tell them about SpringBoard at the same time, to get more excited and motivated. How was your experience using Splash Math? First things first, my students just loved it! 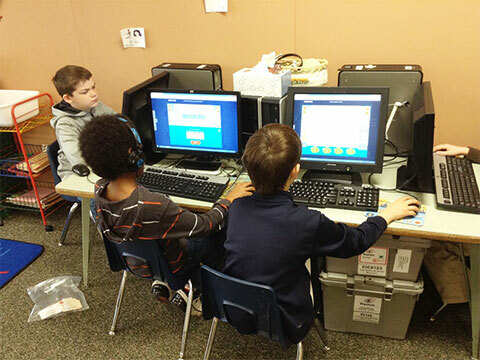 They found it fun and exciting to do math on it, and where earlier it would be difficult for them to sit through a few minutes of math practice, now they were happy to work an hour or more on Splash Math. They liked the animation, the characters, the way the problems are presented, the reward system – just the entire experience. Secondly, I liked the teacher management and reporting tools. Set up was really easy, and once my students started working on it the reports at the student and class level are proving to be really helpful. 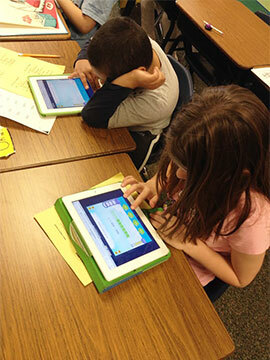 What is the most important benefit you see from using Splash Math in your class? Certainly it is the magical change in attitudetowards math! With the traditional pen-on-paper method or even an online worksheet style, kids would work individually, feeling tested, almost judged, while on it. They would be unsure, kind of hiding in their questions, and there would be no openness, discussion, excitement. This was a blackhole activity that made them feel unsure, under-confident and uncomfortable. With Splash Math, all that changed, instantly. Now I hear math chatter in the class – all the time! Students talking to students about math, students talking to me openly and without any hesitation when they get something right as well as when they get stuck, and students talking to parents. The parents of my students are also really excited about this change – they say it’s so much fun to work on Splash Math with their kids at home and actually have conversations on math! That now there is excitement, sharing, fun, comfort and openness in their attitude towards math, and of course, confidence, is just such a big thing for me as a teacher. Are there any other benefits or changes because of Splash Math? Yes. Another very important positive of using Splash Math is teaching moments. As a teacher, I love it when unplanned moments are created in the school day for us to pause and think together over a problem, giving me the ideal opportunity to provide a useful insight. With Splash Math, I am having many such instances come up in class. This is because the problems in Splash Math are presented in a challenging and unknown format many a times, and it forces my students to think. They need to stretch their brains often, push boundaries, and get into unknown territories. But because of the fun and non-judgmental environment of Splash Math, the students are excited and happy even to get into uncomfortable math territory. They are open to talk to each other and to me about this, and right there, I have a teaching moment – a challenging unpredictable math problem that I teach them to think in the right away about. 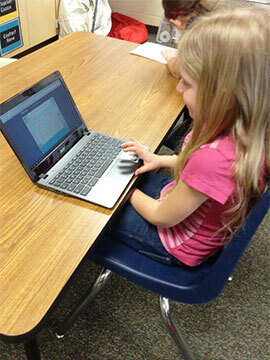 There are so many such “Aha” and “Eureka” moments in class, thanks to Splash Math! Do you have students of varying abilities in class, if so, how does Splash Math work across that range of abilities? I do have students at differents skill levels. Splash Math caters very well to that difference, in fact, it has created a level-playing field for my class, with appropriate practice for both the high level kids as well as those behind on certain concepts and skills. This is another advantage for me as a teacher, I can use a single tool across the class, with no-one getting bored because it’s too easy, or frustrated because it’s too difficult. I have found Splash Math to be great for my differentiated classroom. Finally, how’s SpringBoard going? We see you’re on the leaderboard! It’s going fantastic! I have the leaderboard up on the class board, updated every single day, since my students ask me to. They know that we’re doing well and we’ve got a good chance at winning. Winning will be fun of course. But I often tell my students that even if we don’t eventually win, look at how much we have achieved already! We have had enormous learning in these three or four weeks, we feel great about math – a confidence that will never leave us, and each of us is more than ready to go confidently into 3rd grade. That’s a great outcome for us, and my students agree – while still checking the leaderboard several times a day!